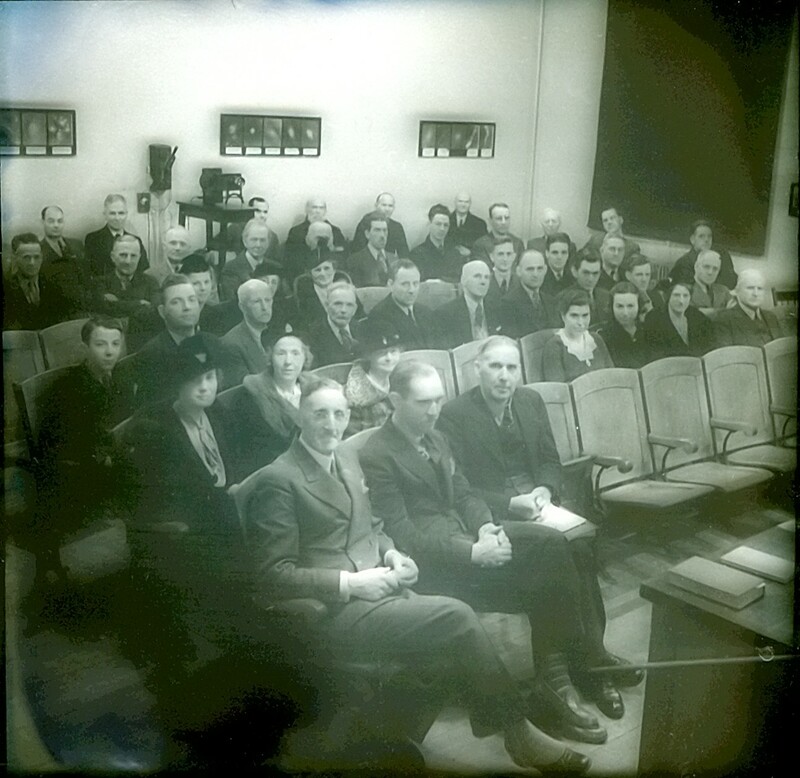 It is a copy of a photograph of the Toronto Centre meeting at which I gave a lecture entitled Photography or some such [Photography and the Astronomer according to JRASC]. I took the photo after my talk and developed it then and there on the table in room 104 (corner room on first floor--you remember) and projected it for the audience. You can no doubt find the date by consulting the Journal issues for the winter 1937/38. Did I not give you a copy before? First row: Three gentlemen--officers of the Centre?? Second row: Margaret Heard, two unknown ladies, two empty seats, Shirley Patterson--later Jones (taking her M.A. before going to Harvard for her Ph.D. with Harlow Shapley), Ruth Northcott, Miss Fuller (DDO librarian and factotum in the DDO office), and an unknown man. Third row: Ten toronto Centre members. Fourth row: Two empty seats, my closest friend Betty Malcolm, later my wife, my aunt Winifred Barnstead, first director of the Library School, and Helen Sawyer Hogg. By the lantern: Quite possibly it was Jack Heard.If you have any further questions, let me know. My email is d.macrae@utoronto.ca but I am slow to answer--Betty is confined to a hospital and I try to spend as much time with her as I can.